above and below the sea surface. Landhuis Bloemhof is located at Sta. Rosaweg 6 in Curaçao. 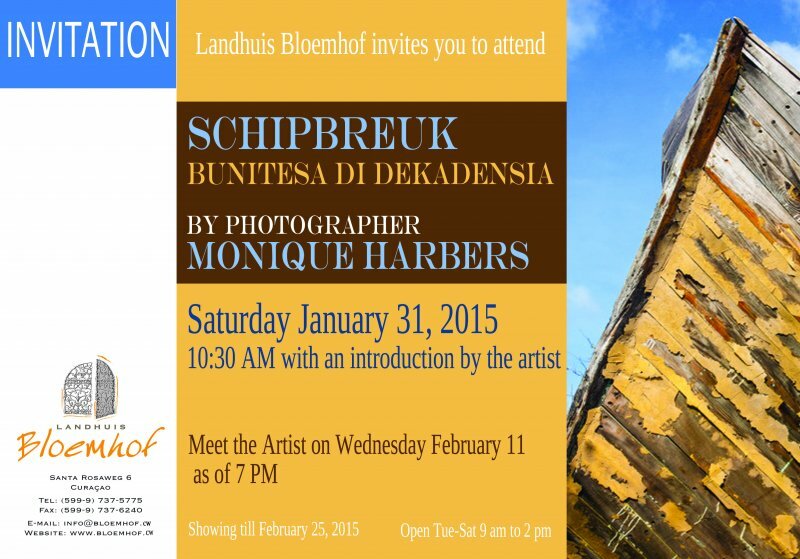 Meet & Greet: Meet Monique Harbers on February 11, 2015 in Landhuis Bloemhof. Monique Harbers (1968) has been working and living in Curacao for a few years. She is inspired by the vibrant colors of Willemstad. The upcoming exhibition at Landhuis Bloemhof has already been successfully shown in MuZEEum in Vlissingen in 2014. In 2014 Monique was invited by the organization of Curaçao North Sea Jazz to exhibit her photographs in the musician’s lounge and dressing rooms, during the event. 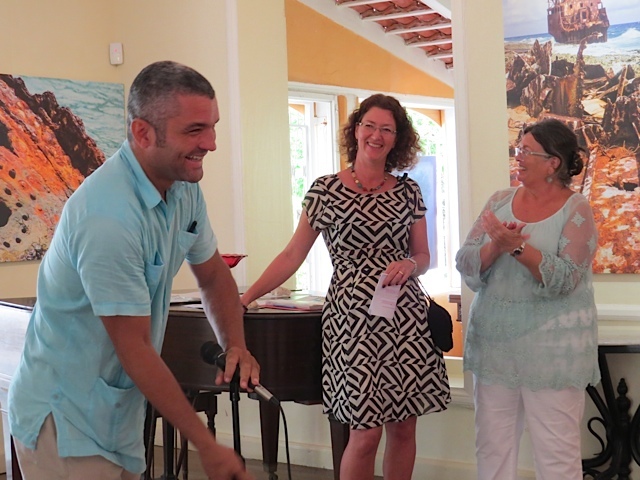 As a starting artist it was a privilege for her to receive the invitation and show her work to a select international audience. 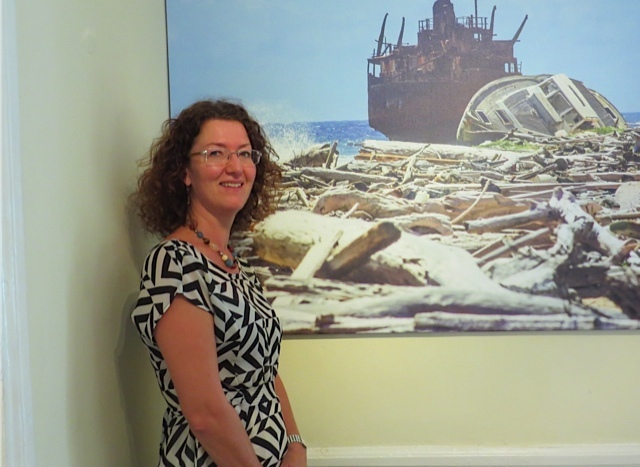 Her first exhibition in Curaçao was held at the Maritime Museum, titled ‘Minus 400 feet’, in 2012. These photographs were taken from the submarine at Curaçao Sea Aquarium, the Cura-sub. For this series Monique chose to enlarge the pictures, showing the coarse grain of the digital photograph. The effect is playful but it was a daring move, considering that digital photography seems almost solely focused on creating ever sharper images. 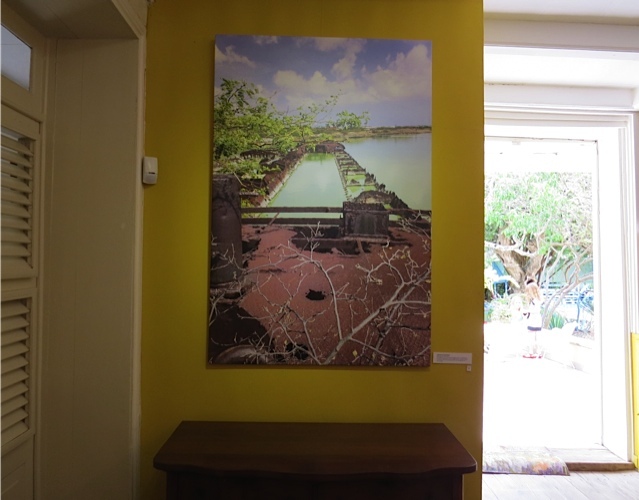 In the present exhibition the photographs are printed on large canvasses. For some pieces, size and sharpness create an overwhelming impact. The series is dominated by hard colors and a direct visual language. 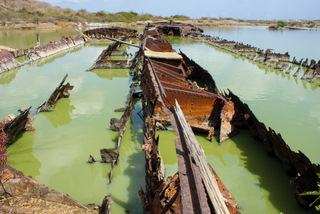 The series ‘Shipwrecked’ shows wrecks found in Curaçao and Klein Curaçao. 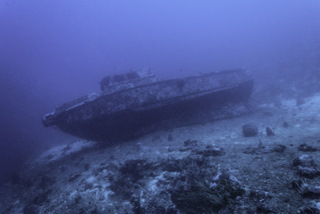 Guided by Francois van der Hoeven, from Stimacur (Foundation for Marine Archeology in Curaçao), Monique photographed wrecks like ‘The Pioneer’. 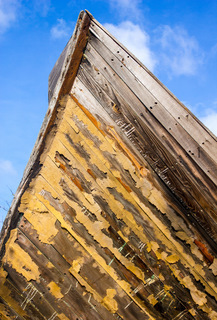 In 1920 this was the biggest wooden ship ever built in Curaçao. 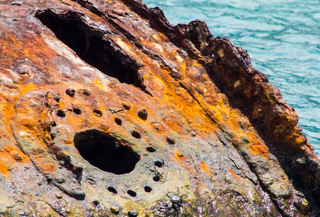 During World War II it was stalled next to Wrakkenbaai, where it stayed and slowly began to disintegrate. 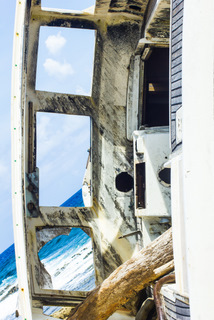 All photographs are accompanied by a text, explaining the origin of the wreck. Unintentionally this exhibition is also a document, uncovering pieces of information about our maritime history. The exhibition remains till February 25, 2015. Click here for the website of Monique Harbers.